You may have seen the news that non-binary residents of California can now select X as their gender on state identification (instead of simply male or female). California is one of several areas which now allow a third gender designation. Similar laws are in effect in D.C. and Oregon. D.C.'s law also permits individuals seeking to change their gender marker to make the change without certification from a medical provider or any other individual. Last year, for the first time in the U.S., a judge in Oregon ruled that the state must recognize a third gender and applications for state identification have been updated to allow for the selection of X. This is notable in that the policy changed via a the court system, rather than the legislature. Australia and New Zealand have allowed for third gender designations on passport applications since 2011 - so while this is new to a few U.S. states, these policies are changing elsewhere, too. Currently, Denmark, Germany, Malta, Canada, Pakistan. India, Ireland and Nepal also allow third gender options on passport applications. While Gender X is the most popular third gender option, there are some which use "other" as an alternative. With more and more people identifying as transgender and non-binary, it makes good business sense to consider a third gender on the forms used within your company. 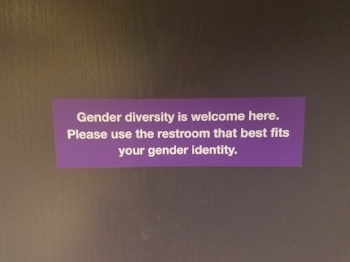 It sends a clear signal of inclusivity to guests and employees and can improve customer service. We've all heard it and most of us probably use it. And while "guys" generally doesn't literally mean "men", it's still important to consider language when greeting groups of people. The greetings that follow are much more "gendered" than "guys" - and can be risky if one or more of the people in the group is transgender or gender nonconforming. "What can I get for you ladies?" "How are you doing tonight, gentlemen?" Imagine a situation where a group approaches a host stand at a restaurant and the host opens with, "Good evening, ladies!" - yet one of the group is a trans man or non-binary. That guest will probably feel quite uncomfortable. In fact, one of our survey respondents shared, "As a trans man, I've been called "ma'am" or included in a greeting of 'ladies' when with my wife, and it makes me want to never return to that establishment. Using gender-neutral terms can be more comfortable for everybody." What's a more successful approach? "What can I get for you folks?" Language matters, and offending guests - even accidentally - can be a costly mistake. Training employees to make a simple change to use non-gendered language can immediately create an atmosphere where everyone feels welcome - and minimize the risk to your brand. There are several states in the country, and several cities, which now require all single stall restrooms to be labeled as all gender restrooms. This is the case in NYC, Denver, Philadelphia, the state of California and a few other places. These new laws are designed to ensure that transgender and non-binary people feel comfortable using the restroom (and as a positive side effect, will also cut down waits for women who often have longer lines). 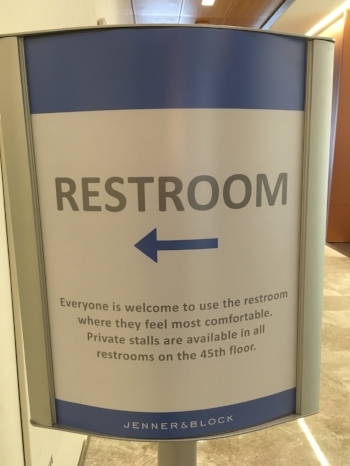 When I travel around to conferences trainings and other events, I love taking photos of the "all gender" restroom signs I encounter, as well as the signs that direct guests to use the restroom where they are most comfortable. Some companies, like Starbucks and Target, established these of their own volition, while others do so in response to changes in public policies. It’s really fun for me to see how different companies are approaching this. Here are some of the signs we've spotted recently. Which is your favorite? Have you made arrangements within your own company to create single stall all gender signs?